KPN has got a debugger tab on its LoRaDeveloper site where you can see the 10 most recent received messages. You can’t see any real metadata like gps coordinates of the gateway there, but it helps to see if the node is successfully sending messages (actually: if it send messages that are successfully being received). But on the Loggly dashboard, the messages and all the metadata was displayed as soon as they arrived, so that was reassuring. 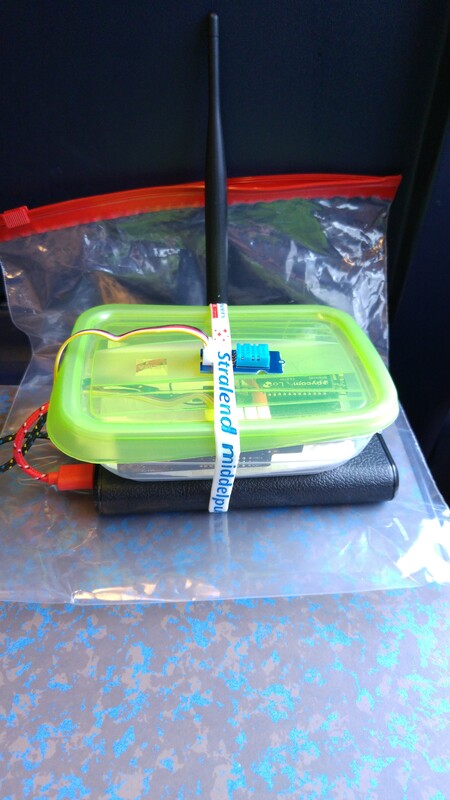 The Marvin, despite it not having an external antenna, it being in a plastic container in a fast moving train delivered a lot of messages during the day. The LoPy did nothing at first. No messages were being received due to the network being down. But even while the network was up during the trip back, still nothing. 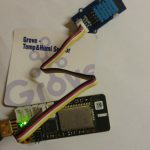 When I connected the node directly to my laptop so I could see the messages, I realized what was a possible problem: I was using OTAA (over the air authentication) and that requires 2 way communication between node and gateway. 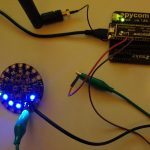 Not that the LoPy can’t do that, but it means more time needed to register. So, I switched to ABP (authentication by personalization) and finally messages arrived. Not as often as with the Marvin, but it worked. BTW, TTN has a really cool mapping tool for situations like this: ttnmapper. 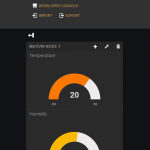 I installed the app on my Android LG G4 and it then uses the GPS of the phone to determine where you (and the node) are. Keep in mind that it totally drains the battery of your phone, so bring a backup/spare battery. So, who did a better job at receiving the messages from my two nodes? Was it KPN or TTN? 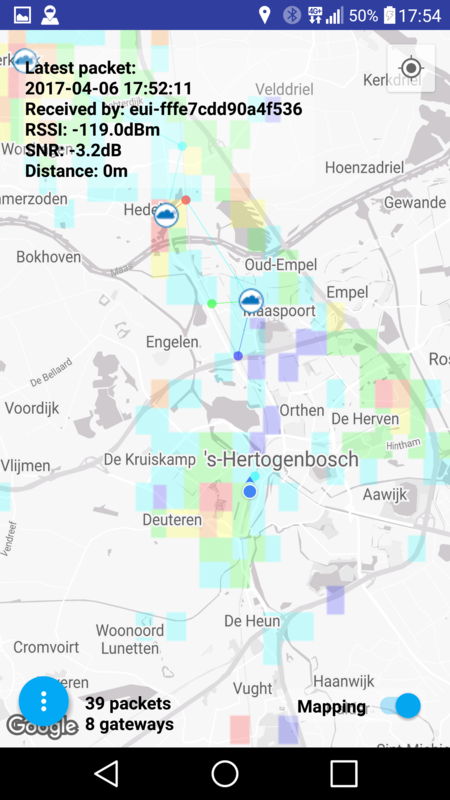 I didn’t need much analyzing to conclude that, despite the really cool TTN map, and despite that my train trip went through areas like Eindhoven, Den Bosch, Utrecht, Amersfoort, KPN has much better coverage in between those cities. I did notice that sometimes there were a couple of minutes between messages, so data probably got lost also (note to self: use a counter a message contents so that it is possible to see how many packages did not make it! ), but overall the coverage, in particular with this speed was impressive. 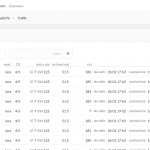 Loggly.com uses JSON to store, export the data. I wanted to extract just the coordinates of the gateways. That sounded easy enough. I exported the data to csv. However, in case of TTN, the message can be received and relayed by multiple gateways which all get listed in the data. If I export that to csv, straight from Loggly, the conversion doesn’t work. You get a csv, but for stuff like the coordinates, gets buried in a single word “array”. I should be relatively easy to see that the left map (TTN/LoPy) contains much less gateways than the one on the right (KPN/Marvin). 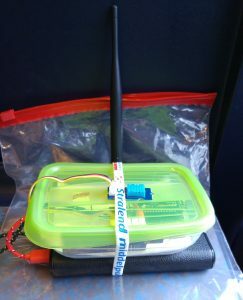 KPN can be considered the current champion as far as the comparison “LoRaWAN messages from within a moving train” goes. 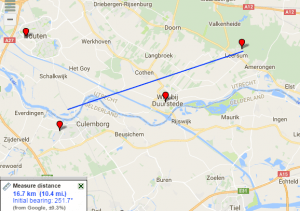 Most impressive is one gateway, that according to its coordinates is over 16 km from the train tracks. 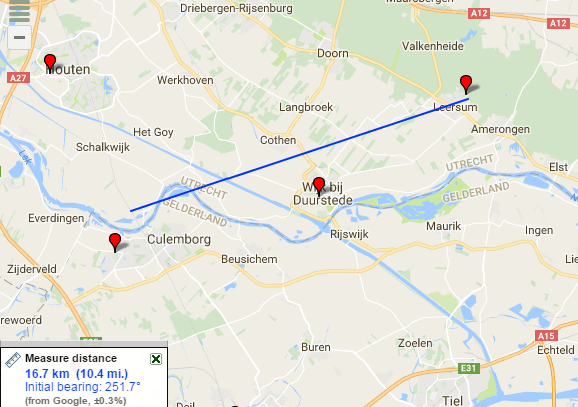 I know LoRaWAN was meant for much larger distances, but considering that the Marvin has no external antenna, just the one on the motherboard and was located in a fast moving metal object, I had not expect to reach those distances. Does that mean that TTN is bad or useless? No, not automatically, but it does mean that if you take a node, connect it to TTN and travel across the country, there will be a lot of areas where the node won’t be able to connect. 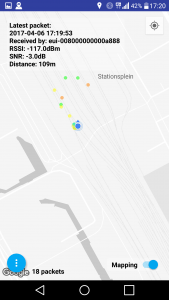 Unlike with KPN, where a scenario of a container on a freight train sending temperature data (and preferably of course GPS for the node) via LoRaWAN looks like a totally feasible scenario already. Even if some packages get lost, the coverage is good enough. Then again, at Utrecht CS for example, the TTN connection was great. 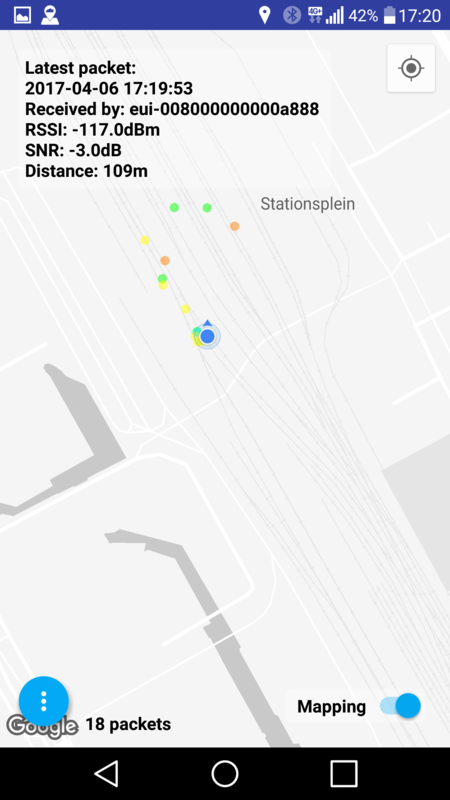 The mapping tool showed that, even while I was walking around the train station because I had to change trains, the messages were being delivered. 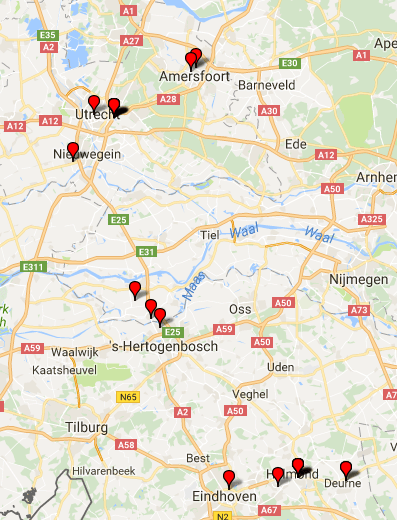 And so was the situation in some other areas like Eindhoven, Apeldoorn, even passing through Helmond resulted in a number of close-enough-by gateways. 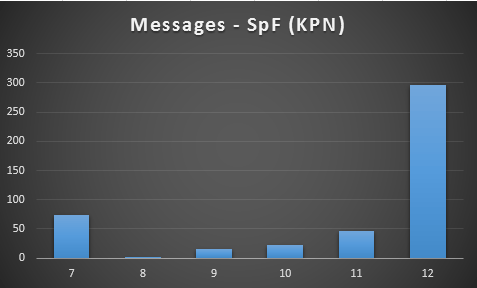 Also, the TTN node (the LoPy) reported all transmissions being done using SPF7 while the Marvin on KPN used SPF12 a lot (for most of the messages). I do not know what makes the node decide to switch the spreading factor and thus the possible range of the transmission. For either nodes, the code itself doesn’t contain anything that looks like something that changes this. One option of course would be to repeat a test like this with both nodes on KPN or both nodes on TTN to rule out differences caused by the node, their firmware and the programming used. I don’t have to be in Zwolle for a while, but given that KPN has full coverage of the Netherlands, other routes are a possibility there also. For another TTN test, my usual route to work isn’t that optimal since even ttnmapper doesn’t show any gateways even remotely near that route. Ik ben ook benieuwd naar de payload die je verstuurd met beide boards. Toevallig heb ik ook met zowel de Lopy als de Marvin getest met een KPN Lora developer account. Met de Marvin komt deze payload bij mij goed door bij KPN (bijv. ik stuur AA (hex) en bij KPN komt AA binnen). Met de Pycom echter wordt er iets heel anders weergegeven bij KPN als wat ik gestuurd heb. Heb jij last van een vergelijkbaar verschijnsel of zou je dit kunnen testen? 0x01 Wordt dus “ef” terwijl ik gewoon 01 had verwacht. Dat klopt. Ik weet nog niet helemaal *waarom* de Marvin data wél en de LoPy data niet direct “leesbaar” op de KPN site (maar ook bijvoorbeeld bij Loggly terecht komen. Ik weet inmiddels wél hoe ik de LoPy data daarna weer kan ontsleutelen zodat ik de oorspronkelijke waarde ook daar weer terug krijg. De uitleg is te vinden op deze pagina . De afbeelding legt het redelijk duidelijk ut. Je hebt je AppsKey en je DevAddr nodig om samen met de FCntUp waarde op deze site (of natuurlijk gewoon in je eigen script) een sleutel te genereren. Die sleutel gebruik je niet helemaal, alleen net zoveel bytes als je nodig hebt voor het je payload. Via een XOR tussen de payload en de sleutel (kun je op deze site testen) krijg je dan weer de oorspronkelijke waarde. Let op! In mijn geval (maar dat is bij TTN ook zo) lijkt het dan in eerste instantie alsof ik niet dezelfde waarde krijg, Het resultaat is namelijk “39 30 63 62 31 31 66 30 62 65 31 31 63” (zonder spaties). Dat komt omdat de HEX waarde “39” in de ASCII tabel terug te vinden is als “9”. HEX waarde “30” is “0”, HEX “63” is “c” etc.